I created this printable that can be used three ways! Click the image above to download it. I will share below the three different ways you can use the packet. To create the flip chart, start by printing out the second page of the packet and decide which 'jobs' to include. I laminated mine (which isn't necessary) and taped each picture in a row on the top of a long piece of construction paper. Leave a small strip above the pictures open to put the magnets. Also leave enough room underneath the pictures to be able to cover the them entirely when folded horizontally. Cut vertical slits in the paper so that only one picture will be covered at a time. Finally, place strips of magnets at the top and bottom so that each section stays closed when flipped up. You can also use velcro! I found a roll of magnets as well as velcro at Walmart. 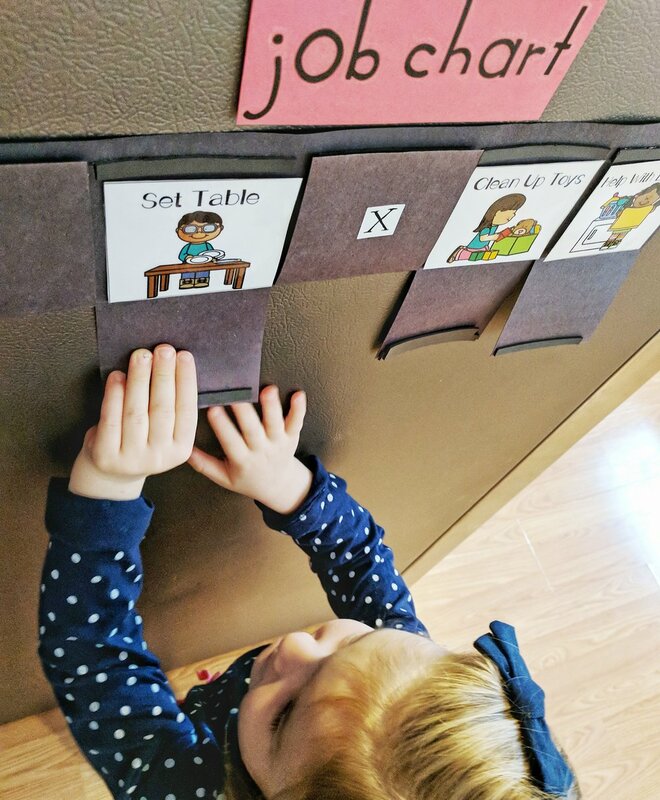 I love this version of the chart because I am able to flip down the jobs I want her to complete and she loves being able to flip them back up when she is done! For the clip system, print out two copies of the second page of the packet. 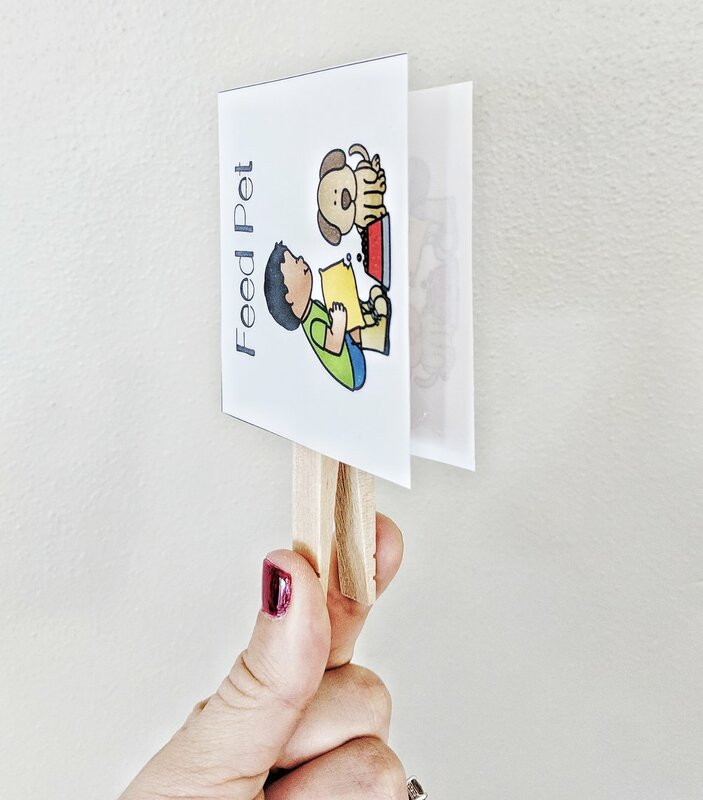 Choose which jobs you want to include and tape two of the same picture to the front and back of a clothes pin. Cut out two long strips of construction paper in green and red (or whatever colors you want! I only used green and red because I think kids correlate them to START and STOP) and tape them together. You can load all of the jobs that need to be done on the left and when they are done your child can move them to the right. This is why you need the pictures on the front and back of the clips so that they show when they are flipped! This job chart is the easiest for adding or taking away jobs without recreating the entire chart. For the checklist, all you need to do is print out the third page of the packet. You can laminate it or put it in a page protector. 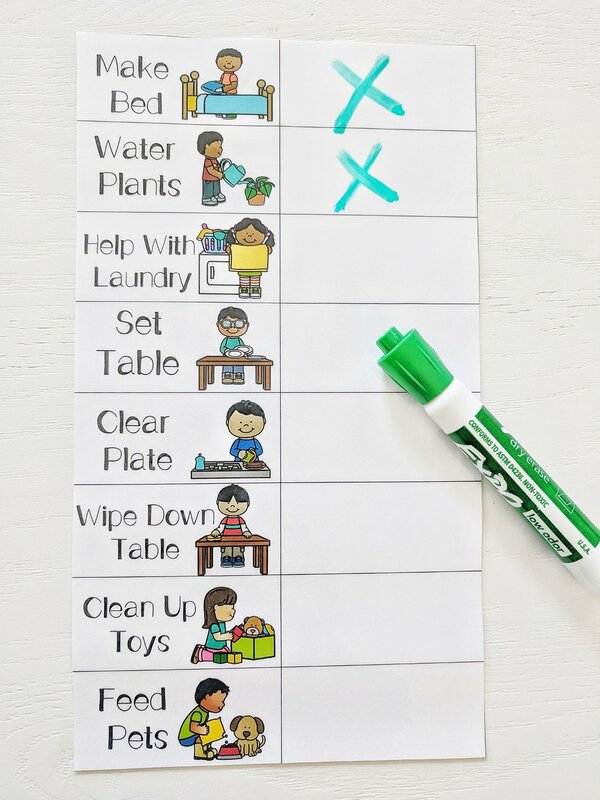 As the chores are completed, you can have your child check them off with a dry erase marker. If you want the chores in a different order or you don't want to use some of them, you can cut them out individually and tape them to a separate piece of paper. If you're local I'd be happy to share my laminator, velcro and magnets! Also, if there are chores that your child completes that you don't see in the packet, just send me an email at akdavitt@gmail.com!